I am so excited to share with you this chair I just finished. After selling my antique dresser and finishing this chair over the weekend, I feel so free and liberated! Don't get me wrong- I love a good project (or five at any given time) but I can't ever seem to accomplish other tasks when I know that these unfinished items are patiently waiting for me to beautify them. It's a disease I tell ya. from this $10 chair I picked up a little while ago from my local D.I (Thrift store). Here's a quick run through of how I created the new and improved look. For more detailed tutorials on re-upholstery, please read my recent posts HERE and HERE. The springs were still in tact and in great condition, so fortunately I had no repair work to do there. After a light sanding of the frame with a fine sanding block, I primed the exposed frame with Rustoleum Painters Touch gray primer. 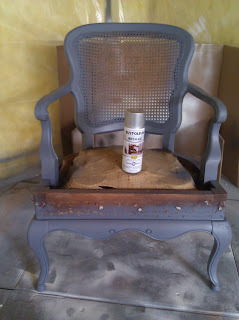 I followed the primer with a quick light sanding to get rid of the gritty texture, and painted several light coats of Rustoleum Metallic Silver Paint. I followed the paint application with a very subtle glazing focusing on the nooks and crannies with Valspar's Antiquing Glaze, and lastly sprayed several light coats of a clear protective coat. This method was very similar to the one I used for the Faux Mirrored Night Stands I created (tutorial here) but much faster. Since the caning on the back of this chair was damaged, I opted to upholster it. I quickly pulled the torn edges together with zip ties (pulled gently for a snug fit without ripping further into the caning). 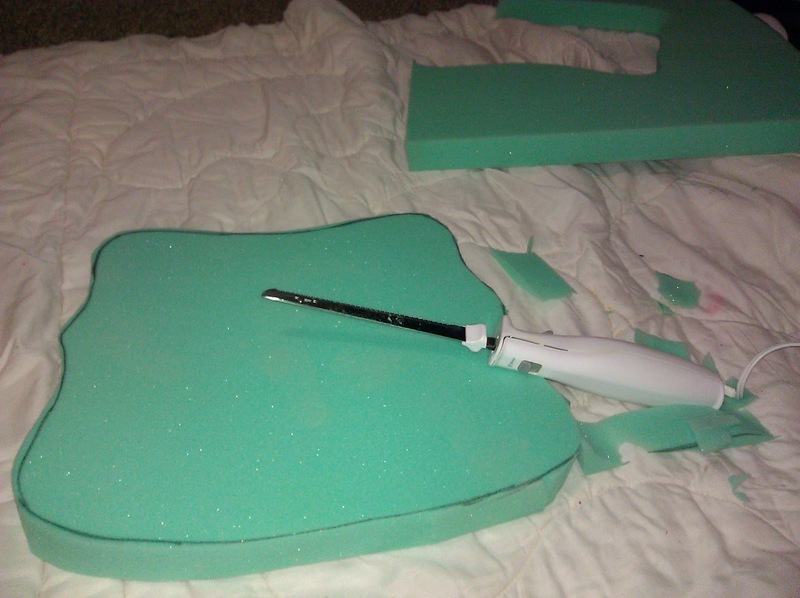 Using a 2" thick foam I purchased from Joann with my 50% off coupon, I created a template with wrapping paper and cut out my foam using a carving knife. With a little help from Buzz Light Year and my spray adhesive, I glued the foam to the caning. I upholstered the back with this fantastic chevron print that I purchased from fabric.com (this was my first experience with them and it was AWESOME. I will be purchasing much more fabric from them again in the future.) 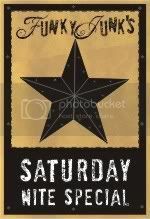 Thanks Caitlin Creer for posting about this fabulous print! I trimmed down all of the excess fabric and batting getting as closely to the staples as possible. I sewed my double welting cord and hot glued it in place to cover all of the staples. I repeated the same process on the back, but only used a layer of batting and no foam. 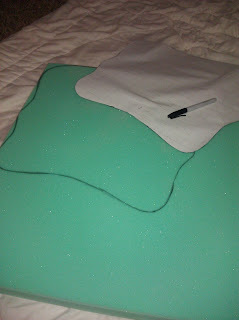 For the base, I used a super thick (approx 6") foam piece that I bought for $1 from the D.I. off of a couch that they were sending to the landfill. I cut my foam to the desired size but was short on a few sides so I glued two smaller sections with spray adhesive to create the perfect shape I needed. I stitched together a fairly complicated seat cushion with piping (complicated for me anyway...), and stapled it as tightly as I could over the foam and batting. Next, I stitched together the front piece with piping, and stapled the top inside. Once it was stapled in place all the way around, I filled her up with some cotton batting. I pulled the bottom tight and stapled in place as closely to the bottom as possible. I trimmed off the excess fabric, and covered up the staples with more double welting cord. PHEW! Now wasn't that easy??? Here she is all dolled up for her photo shoot. Man, this corner in my Master Bedroom is sure getting a lot of attention from these cute chairs lately. So what do ya think? She's been claimed already by my very first official client. I can't wait to see how she looks in her new bedroom. Stay tuned for part 3 of my Re-upholstery Series coming very soon! OMG! The chair is amazing and so are you :) I'm jealous I have a chair waiting in my basement for a makeover (maybe I'll ship it to you). I can't wait to see your next masterpiece. Omy goodness. that Chair is so gorgeous now! you are amazing. thank you so much for sharing! I'm curious to know how much it costs you to do these make overs and what you sell them for. is it worth it? came from tip junkie and am your newest follower- if you can tackle this- i'm excited to catch up on older posts!!! You did a STELLAR job!! I know reupholstery is NOT easy, but you pulled it off like a pro! I wish I could sew so I could do some double welt. Are you kidding me??? This is amazing. I am so inspired. Will be showing this on my blog at some point if that is okay! Seriously impressive! I have a chair similar that I have been thinking about trying myself. After seeing your project, I'm pretty sure I should not attempt it. It will look nothing like your masterpiece. I love it. I'm your newest follower. Wow, I LOVE this chair! The fabric is gorgeous, and who would have thought that ugly thrift store find would turn into such a treasure?! Beautiful! PS, I'm a new follower! BEAUTIFUL!! I love that pattern!! Wow - this looks fabulous. Love the chevron stripes. This is the most beautiful chair ever! 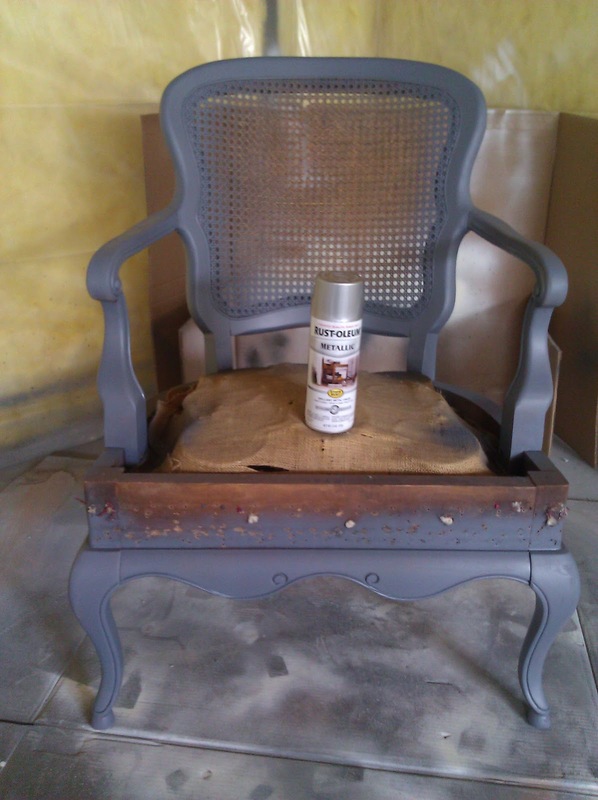 I'm loving the metallic silver, the awesome chevron stripes, and your AMAZING job on the chair. Are the stripes on the fabric more blue or gray? Also, am a new follower! Would love if you'd check my blog out sometimes. What a gorgeous chair! You really did a phenomenal job! I love the fabric also (and that adorable lamp!) Thanks for showing us how it was accomplished! WOW, this is a beautiful chair...great job on the makeover! You did a super duper job here...love the color! first off, BEAUTIFUL! and secondly, thank you for showing the process, it was very helpful! Jen! AWESOME. It turned out so freaking cute! great job. you did a beautiful job on this!! Great tutorial- love the use of zip ties to hold the caning together. I am going to have to bookmark this. 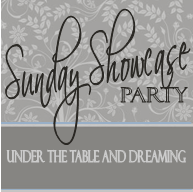 I host a Wednesday party called Transformations and Treasures, I'd love it if you wanted to share this! Love your fabric choice. I need to try to tackle the double welting at some point in the near future too. Talk about multi-talented- Fabulous work!!! Love it. Wow you're an amazing sewer! This chair turned out great. And the tutorial is so detailed! Thanks for posting this up. I'm a new follower. 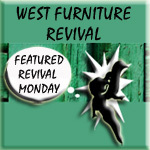 Can't wait to see the next part of the re-upholstery series! The chair is gorgeous! Your hard work paid off. I love the metallic finish with the glazing--it's a nice subtle touch. Did you make that pillow that's on the chair? I love that, too! is it possible to love a chair as much as i love that one? i want to come sit on it, or maybe not for fear of touching it and ruining it. it is gorgeous! WOW!!! Fantastic job! You make it look so easy but Im sure it wasnt!!! Very inspiring! Thanks so much everyone! I am feeling the love for sure. It's fun when others love something as much as you do! Kylee- I keep my cost for materials very low, but I certainly put in a significant number of labor hours. I could probably sell my items for more than I do, but for me it's mostly about fueling my hobby. Karen- you're wise to start with smaller projects and work your way up. I'm sure you can do this too though! Erin- the pillow was a gift to us from my sweet mother in law in Germany. I love it! Ummm...I'm in love. I have a similar style chair that I was afraid to tackle. Thanks for some pointers!! Beautifully done. I will now head over to fabric.com and check it out. I am a bit obsessed with fabric and the color in that chevron print is to die for! Wonderful, wonderful job. Love that fabric choice, too. I need this in my house ASAP!! This is so beautiful! I just featured you on my blog www.thriftyandchic.com, come grab a button! Love the Chair...You did amzing.. Love the double welting. .Need to learn to do that. You did a great job reupholstering this chair!!! FABulouso! And a great tutorial! Thanks for sharing. That was quite a job, but it turned out GORGEOUS!!! It's stunning with the silver paint and the chevron print. I'm putting your chair in the PoPP Spotlight. Thanks for linkin up! Wow! I just saved this picture. Gorgeous finish and fabric. Oh my ! That is so impressive. You make it look so easy. The chair looks fabulous. Thanks for sharing, and looking forward to more of your posts. I'm not usually a fan of these chairs but I absolutely LOVE yours!! The color and the chevron fabric is amazing. Great job!! Your chair is stunning and yes, you do make it look easy. I just happen to know from personal experience, upholstery is not that easy. Your chair looks perfect and I love the fabric! I am envious that you live by DI, the best thrift stores ever! When I visit my sister in Utah, we drive to a different DI everyday! Good eye! Fantastic finish! and Terrific tutorial! Looks A-MAZING!! I am in love with this chair! The fabric, the shape, everything! I can't believe you found it for $10!!! I am a fairly new follower of yours and we do a lot of the similar projects, so I am glad I found you! That chair is amazing. That is one thing of many that I sure don't know how to do. What a talent you have. Thanks for joining WUW last week. Wow this chair is amazing! I love the fabric (I just made some pillows out of it). 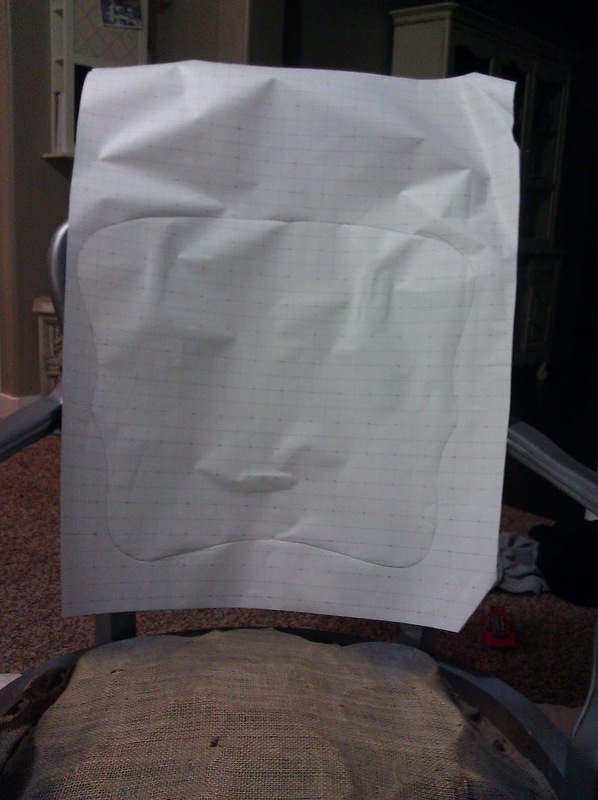 This tutorial is just what I needed to redo the chairs I just bought. Hopefully in the near future I can post about them too. Great job on the reupholstering! The chair is gorgeous, and I really heart when the pattern matches up so perfectly! You're a rock star! oh my gosh, I LOVE your chair sooooooooo much! I would die to have that in my home! Not to mention would love to have the sewing skills to do that! Way to go! That is an absolutely stunning chair!!! AMAZING!!!!! I am in awe! You seriously have some crazy mad skills to do that! Knuckle bump to you! Have a happy Tuesday! PS~I am your newest follower and I can't wait to see all your other projects!! Just found your blog and LOVE it!! This chair is A-MAZING! 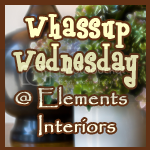 I have a kid's size wingback chair that I want to redo and you may have just inspired me! I'm totally following your blog now!! Love this chair! Just found your blog! I'm featuring this on my blog today - I run a series every Friday called for the love of chairs! The metallic finish with the chevron is so so beautiful! you did such an AMAZING job on your chair! awesome tutorial too! 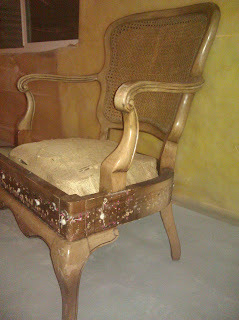 So, I love this chair... okay, really, I love your blog in general! I just wanted to stop by and let you know I mentioned you on my own blog because of an idea you inspired in me from this post! Wow! Amazing job on this beautiful chair! Thanks for the detailed photos too! I've always been nervous about tackling an upholstery project, but after reading yours, I just might try it one of these days! I love the fabric you chose too! Found you over at Not Just A Housewife's DIY Projects Contest! Nice job! You're incredible. I'm glad that I found your blog. Oh I love it. I have had my eye out for an awesome AND comfortable chair to re-upholster, but my thrift store doesn't seem to have anything worth the effort (mostly old IKEA stuff that's not very strong). Hi there. Nice blog. You have shared useful information. Keep up the good work! This blog is really interesting and gives good details. Bar Chairs in India, Conference Chairs India. 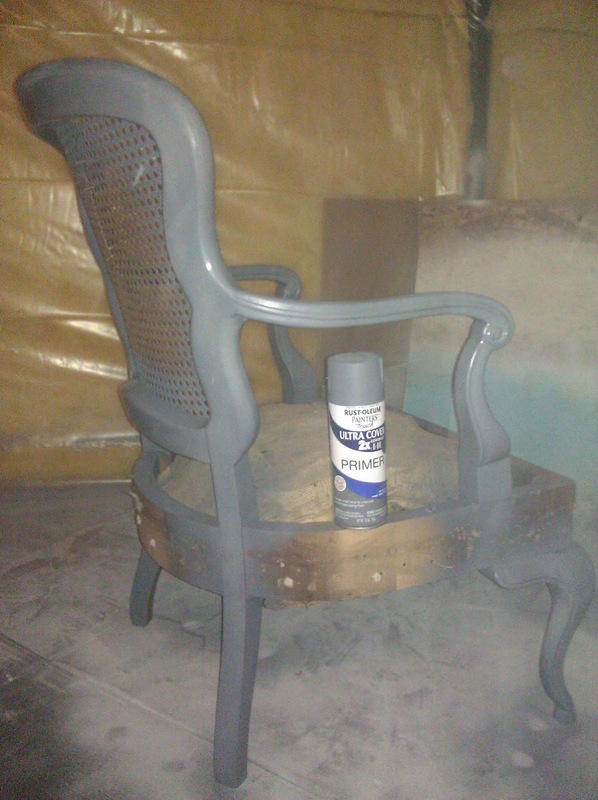 Wow, that's a gorgeous 'after' - you've done a beautiful job fixing up that chair. I've got this linked to my chairs post too today, well done! Also, I'm your newest follower:) Have a great weekend! It looks like it was a lot of work but when you look at the before and after. It's a completing different chair. Good job. The end result is absolutely amazing. I simply love this reupholstered chair. Rookie Needs Help! "Pease" and "Juh- Joo"